A vegetable consisting of dark green clusters of buds, known as florets, which grow on branching arms that connect to a thick leafy stalk. Broccoli is harvested before the buds begin to blossom. This vegetable is a relative to cauliflower, cabbage, and Brussels sprouts. 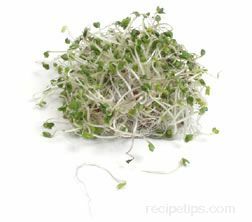 The head of branching florets and approximately 6 inches of the stalk are the edible parts of the vegetable. It is one of the most versatile of vegetables grown and can be eaten raw or cooked. It is readily available, easy to cook and is low in cost. The leaf, stalk and florets can be eaten raw or cooked. 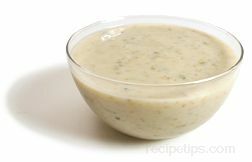 Raw, it is eaten on its own accompanied by a dip or cut up and added to salads. 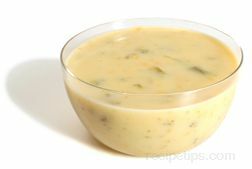 When cooked, it can be eaten as a side dish, alone or topped with a sauce, such as au gratin, hollandaise, or Mornay. 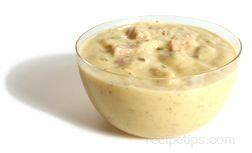 It is also often added to other dishes, such as stir fries, pasta, quiches, omelets, soups, and stews. Broccoli is available all year round in food stores but when growing, it does best in cool weather. When selecting, look for thick heads of compact, tiny bud clusters that are evenly dark green (or with purplish tint) in color. 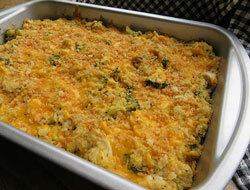 The broccoli should have a fresh aroma and a firm but tender stalk. Avoid heads that have yellowing florets, a strong odor, or open buds. Also, avoid heads that show signs of wilting of the florets or stalk. Broccoli should be left unwashed when storing. Store in the refrigerator in a plastic bag, leaving the bag open or use a perforated plastic bag. This will avoid excess moisture, which causes mold to grow. Store up to 5 days. 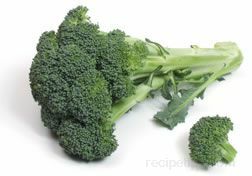 Broccoli can be blanched and then frozen and kept in the freezer for up to a year. 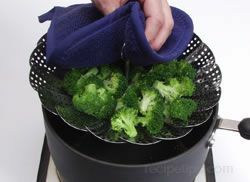 Broccoli is very sensitive to ethylene, which is a gas given off by some fruits and vegetables. The gas speeds up the ripening process so broccoli should not be stored with ethylene producing fruits and vegetables, such as, apples, apricots, bananas, cantaloupe, kiwifruit, mango, peaches, pears, tomato, and white sapote. Most generally referred to as broccoli. This is the most popular and most commonly found broccoli. It consists of dark green clusters of buds, known as florets, which grow on branching arms that connect to a thick leafy stalk. It is also referred to as Calabrese. Purple broccoli is very similar to sprouting broccoli except its florets have a purplish color to them and the heads of purple broccoli are typically smaller. Its taste is the same as sprouting broccoli. A variety of vegetable that is a cross between broccoli and Chinese kale. It has an appearance similar to asparagus or gai lan, with smaller broccoli buds on top. Eaten raw, it is a tender, less fibrous stalk, that is crunchy and flavorful. This vegetable can be used in the same manner as traditional broccoli, served in salads or as an appetizer with a dip. 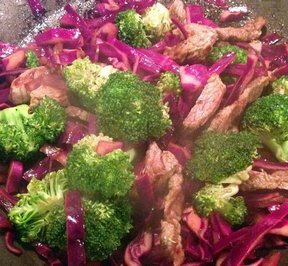 However, it is very adaptable to stir fried vegetable dishes, or sautéed in olive oil to provide a deliciously flavored vegetable complement to a meal. It is also known as baby broccoli. 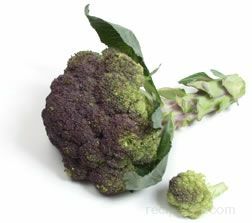 A vegetable that is a cross between broccoli and cauliflower. 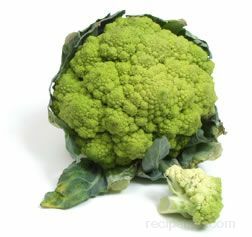 Its appearance is the same as a cauliflower except it is light, bright green in color. It has a slightly sweeter taste than regular cauliflower when eaten raw and when cooked, its taste is similar to broccoli. 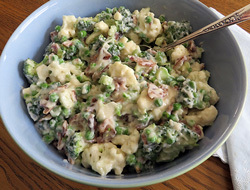 It can be served or cooked in the same way you would regular cauliflower. A vegetable consisting of green clusters of flowering buds, known as florets, which grow on a thick leafy stalk. It is a variety of broccoli that is similar to regular broccoli, but milder in taste and grown on a longer stalk. The stalks and leaves are often cooked separately, cooking the stalks first, until tender and the leaves until wilted. 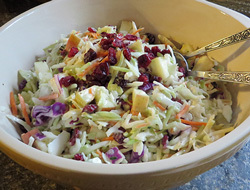 It is ideal to use raw in salads, steam cooked as a side dish, as an ingredient in a vegetable stir-fry, a meat stir-fry, or added to other cooked dishes. 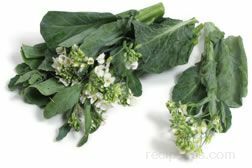 Chinese Broccoli is also known as Gai Lan, Gailan, Gai Laan, Gaii Lan, Gai Larn, Gai Lon, Gai Lum, Kai Lan, Kai Laarn, Kairan, Chinese kale, or white flowering broccoli. Romanesco Broccoli A cross between broccoli and cauliflower, this bright green vegetable grows in a head consisting of many small, spiral florets. Each floret forms a peak. It has a unique and delicate flavor. It is available in the fall, September to November.